PHP-CLI is a simple library that helps with creating nice looking command line scripts. It is lightweight and has no 3rd party dependencies. More examples can be found in the examples directory. Please refer to the API docs for further info. By default the CLI class registers an exception handler and will print the exception's message to the end user and exit the programm with a non-zero exit code. You can disable this behaviour and catch all exceptions yourself by passing false to the constructor. You can use the provided splitbrain\phpcli\Exception to signal any problems within your main code yourself. The exceptions's code will be used as the exit code then. Stacktraces will be printed on log level debug. Colored output is handled through the Colors class. 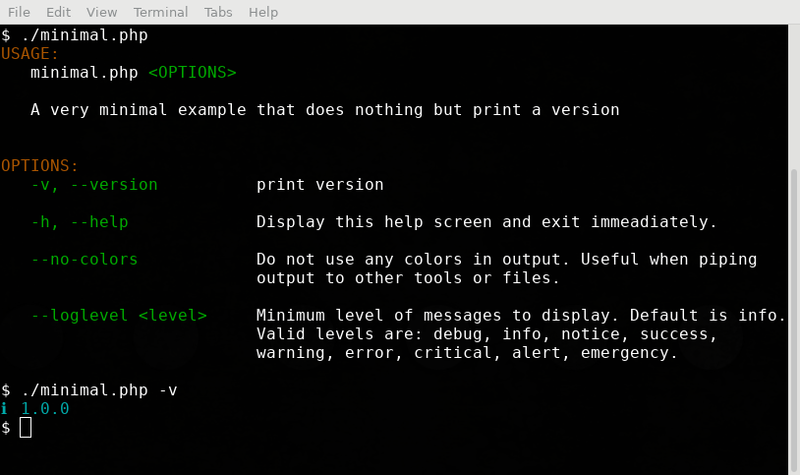 It tries to detect if a color terminal is available and only then uses terminal colors. You can always suppress colored output by passing --no-colors to your scripts. Disabling colors will also disable the emoticon prefixes. Simple colored log messages can be printed by you using the convinence methods success() (green), info() (cyan), error() (red) or fatal() (red). The latter will also exit the programm with a non-zero exit code. For more complex coloring you can access the color class through $this->colors in your script. The wrap() method is probably what you want to use. The table formatter allows coloring full columns. To use that mechanism pass an array of colors as third parameter to its format() method. Please note that you can not pass colored texts in the second parameters (text length calculation and wrapping will fail, breaking your texts). The TableFormatter class allows you to align texts in multiple columns. It tries to figure out the available terminal width on its own. It can be overwritten by setting a COLUMNS environment variable. The formatter is used through the format() method which expects at least two arrays: The first defines the column widths, the second contains the texts to fill into the columns. Between each column a border is printed (a single space by default). See the example/table.php for sample usage. When mixing fixed and percentage widths, percentages refer to the remaining space after all fixed columns have been assigned. Space for borders is automatically calculated. It is recommended to always have some relative (percentage) or a fluid column to adjust for different terminal widths. The table formatter is used for the automatic help screen accessible when calling your script with -h or --help. 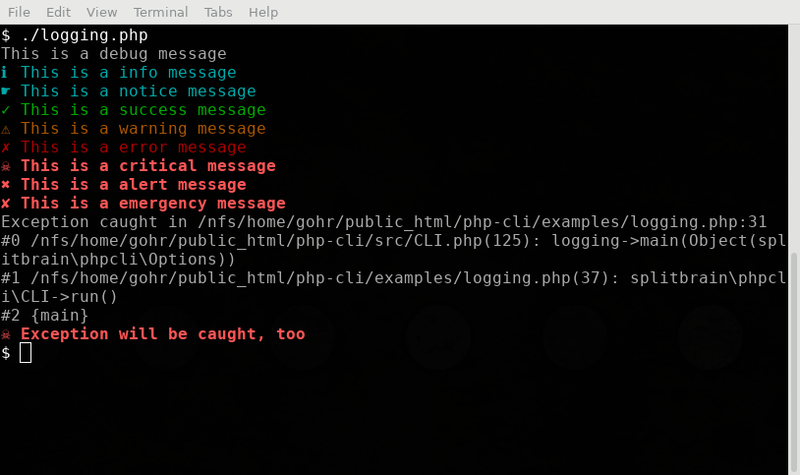 The CLI class is a fully PSR-3 compatible logger (printing colored log data to STDOUT and STDERR). This is useful when you call backend code from your CLI that expects a Logger instance to produce any sensible status output while running. To use this ability simply inherit from splitbrain\phpcli\PSR3CLI instead of splitbrain\phpcli\CLI, then pass $this as the logger instance. Be sure you have the suggested psr/log composer package installed. Convenience methods for all log levels are available. Placeholder interpolation as described in PSR-3 is available, too. Messages from warning level onwards are printed to STDERR all below are printed to STDOUT. The default log level of your script can be set by overwriting the $logdefault member. See example/logging.php for an example.